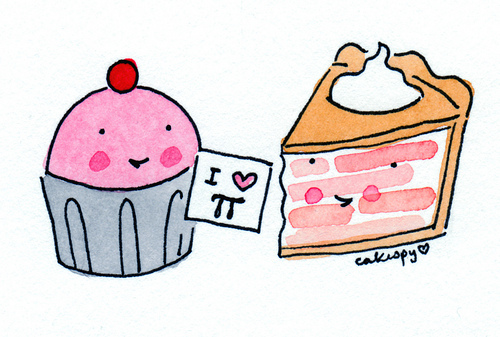 Happy Pi(e) Day! In honor of this auspicious day, we are revisiting one of our favorite places for pie, Honeypie (2643 S Kinnickinnic Ave, Milwaukee, WI 53207) in Milwaukee. Our two favorite things about Honeypie are 1. the PIE and 2. the fact that there is something for everyone. The restaurant is decorated with a classic Wisconsin Northwoods theme, with clapboard walls, reclaimed wooded booths, maps and vintage Wisconsin-y ephemera. Most importantly, there is a dessert case in the back with a variety of pies, biscuits, sweet breads and cupcakes. Over the years, we have sampled a number of Honeypie’s pies, and we have never been let down. Some of our favorites include the black bottom banana cream pie (below), blueberry (below), Milwaukee mud pie, strawberry rhubarb and ginger chai cream. You can order a whole pie in advance ($29 or $32) or by the slice ($6). You can also ship miniature Honeypie pies anywhere in the nation through their Piegram service. To take the pie love to another level, they even host pie-making classes. Black bottom banana cream pie and blueberry pie. There is also a large food menu, with Midwestern classics like mac and cheese ($14), grilled cheese with tomato soup ($11), a classic Friday Fish Fry ($16) and – a treat unique to the upper Midwest – the Cornish pasty ($10). There is also more elevated fare like scallop ceviche ($15) and confit chicken ($24). Honeypie is an all-day restaurant and you can also get brunch or a drink off of their full menu of drinks and local beers. So whether you are in the mood for pie, a Bloody Mary or mac and cheese, you will find just what you want at Honeypie. Happy Pi(e) Day everyone! When we are traveling in the US we love to give a visit to the local pie shops in the area, and sample some of the regional favorites. Fireman Derek’s (2818 N. Miami Ave., Miami, FL), is known particularly for its key lime pie. Fireman Derek’s is a tiny storefront opened in 2014 by actual Miami Fireman Derek Kaplan. There are only two tables inside the shop, but many take their orders to go. You can order a whole pie ($25-30) or pie by the slice ($5-6). There are seasonal flavors like pumpkin, and pies always available include the signature Krack pie (salted caramel custard that was named one of the best pies in Miami), key lime, apple, pecan and s’mores. You can also get some tasty coffee drinks made with Panther beans, cheesecake, milkshakes made with Azucar ice cream, as well as savory pies and quiches. On our visit, we sampled the coconut custard and the key lime, trying to keep with the tropical vibe of our surroundings. The key lime pie had a perfect graham cracker crust and was light and tangy – so good! The coconut cream was equally delicious and was light and fluffy and packed full of real coconut flavor. We highly recommend stopping into Derek’s if you are looking for key lime pie in Miami. Part of the fun is checking out the awesome pie mural on the side of the tiny shop (seen above), good preparation for all of the other amazing murals in Wynwood. Happy Pi Day everyone (3.14) – hope you get to celebrate with a nice piece of pie. We will be seeking one out in Rio de Janeiro – which is actually a somewhat difficult task. If we were home we would be making Sour Cherry Pie, Chocolate Coconut Pie or Peanut Butter and Chocolate Chess Pie. What kind of pie is your favorite?